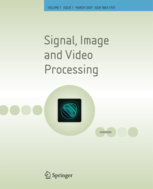 The conference organizers are pleased to announce that a special issue of the international journal "Signal, Image and Video Processing" is planned. The program committee will select the best papers among the scope of the special issue and will invite their authors to submit extended versions of their conference papers. These extended and improved versions of selected ICISP papers will pass through a rigourous reviewing process. Imaging systems and their related processing and analysis tools are becoming widespread and turn to be essential tools in various fields. These systems exploit a variety of physical phenomena at different scales and generate local measures or maps in the form of images. Each of these measures/images reflects a particular aspect of the acquired object. However, in order to properly characterize complex objects such as natural objects that have a multidimensional (physical/biological and / or perceptual) nature, it is necessary to combine multi-source acquisitions also called multimodal. This is indeed a trend currently of integrating various imaging modalities in the same system or at least combining data from different modalities for the same object. As a result, multimodal acquisitions generate heterogeneous and multivariate data that need adaptation of the conventional tools of representation, processing and analysis to be exploitable for different applications. The purpose of this special issue is select the best papers of ICISP 2018 on this specific topic to timely address the challenges in multimodal/multivariate image representation, processing and analysis for solving challenging applications.